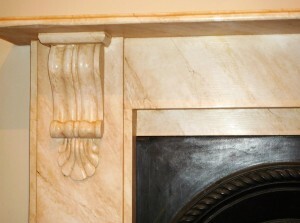 Painted faux marble is a great way to change the look your old cast iron, slate or wooden fireplace, creating a hand painted feature that is unique and often a great talking point. 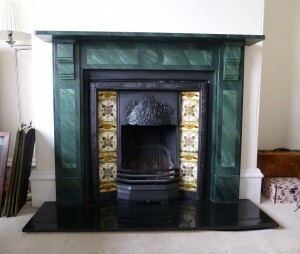 This green faux marbled fireplace was made out of slate and had originally had a marble effect painted on it, quite possibly in Victorian times when faux finishes were extremely popular and sort after. Over the years the original effect had worn away and had all but disappeared. The couple were doing up their new home and wanted to bring the original features back to their former glory, including the lounge fireplace. I undertook the work in my workshop, with the fireplace being delivered by the couple in 4 pieces. 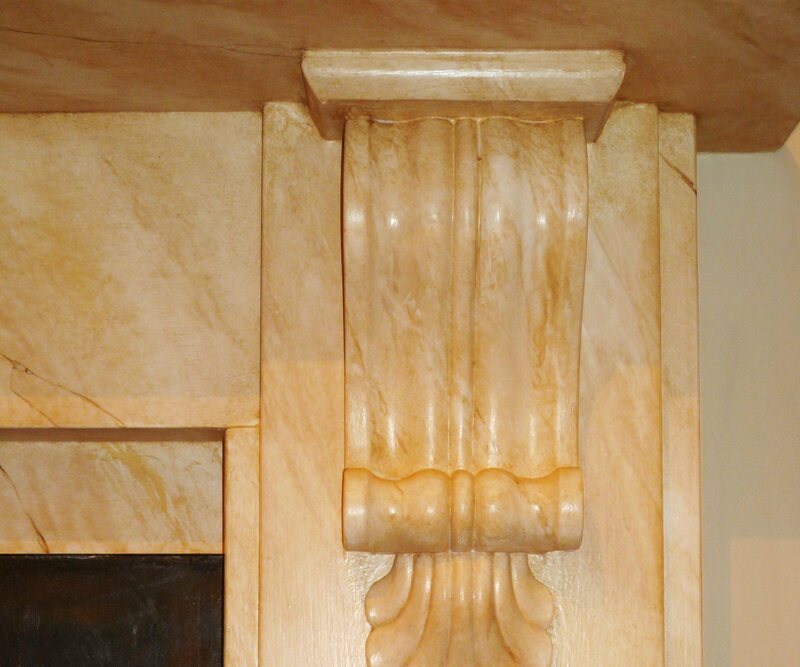 This was as much a restoration project as it was a faux marble one as the fireplace was in pretty bad repair. My first job was to chip away the old plaster and foam attached to the back of every piece. Once this was done I throughly cleaned each piece with sugar soap (this was before the days I had discoiverd Krudkutter), ensuring there was no soot, grease or grime that would stop the paint adhering properly. Once clean i applied one coat of Zinsser Bin and then two coats of a very deep emerald green oil eggshell. This gave me a lovely base onto which i could create the faux marble effect itself. Taking the colours found in Vert de Mer marble I created five oil glazes using combinations of titanium white, sap green, lamp black, terre verte and yellow ochre tubed oil paint. Using both Canadian goose and pheasant feathers, muslin and artist brushes I starting mixing the glazes together and creating the effect you can see in the photo. I always like to work at an angle, left to right, as it suits the way I paint and also a consistent ‘slope’ to the marble, especially on this scale, is more appealing to the eye. Once I’d got the basic effect down I then left everything to dry and returned the next day to add a second coat of glaze. The same method and tools were used, with this 2nd layer adding more depth of colour and further patterning. The third glazing stage was done when the second layer of glaze was dry and involved the veins themselves. These were hand painted with artist brushes and were mainly done in the titanium white glaze. To protect the finish the final stage was varnishing. I applied two coats of Polyvine Extra Pale oil based varnish in an eggshell finish using high density foam rollers and a soft artist brush. And that was that, job done :-). I contacted the clients and a few days later they picked it up, over the moon with the effect and the colour. They then had it professionally installed and now have an original fireplace and a great focal point for the room. For this project I was contacted by an Interior Designer in London who wanted two of her clients fireplaces faux marbled. Both fireplaces were cast iron and in their ‘original state’ dominated the rooms, looking very heavy and imposing. part of the re-design was to make the rooms feel lighter and brighter so rather than going to all the expense, mess and upheaval of replacing the fireplaces (which were after all a very nice design) they opted for the faux marble option. 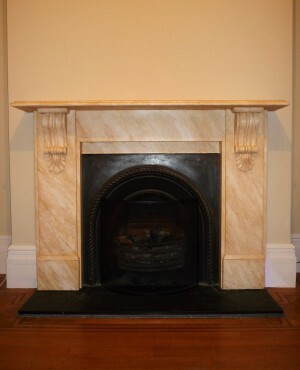 The fireplaces had been prepared by their decorator prior to my arrival, having been primed with Zinnser Bin and completed ‘whited out’ with Dulux white oil eggshell. This gave me the perfect base onto which to create my effect. this time i was going to create a ‘sienna style’ finish using yellow ochres, light beige and white. The same process as outlined above was followed though the veining was added whilst the second coat of glaze was still wet. The advantage to this is that you can blend the veins in a little easier, the down side is, get it wrong and you’ve ruined your second layer of glaze and have to start afresh – pros and cons….. When the fireplaces were finished the sienna style faux marble effect create a lovely balance within the room, ensuring the fireplace remained the focal point but didn’t overwhelm the new décor. “Thank you for the wonderful marbling job, we are thrilled with the work you’ve done on our fireplace. It looks so much like the real thing guests can’t believe it’s been painted!” Mrs B, London.